You won’t find anything near ‘free’ and even ‘budget’ options are limited in the prestigious Maldives, but if you want to dive down to the deepest value for the most dazzling quality, then you want to filter on the ‘Cost Per Star’ field in the Resort Finder. In these challenging economic times, people who need to mind their budgets but don’t want to compromise their trip of a lifetime have a great balance in Kurumba. Ratings are one thing, but enough money will buy lots of sizzle and quality anywhere in the world. A big question is value-for-money. Who gives you the most star-value for your day rate? The winner for 5-star value is Kurumba. Not only does it price itself very aggressively, but it is a good sized island which means there are often some excess inventory deals with operators who will discount the resort even further close to departure date. I find that the ideal timing for ‘last minute’ deals is about 6 weeks before intended departure – much earlier and the operators haven’t resorted to discounting yet, and much later the deals are mostly gone. Kurumba is a proper 5 star in every respect. A number of Maldives resorts do sometimes advertise ‘5 stars’, but some are being a bit ambitious in their assertion. 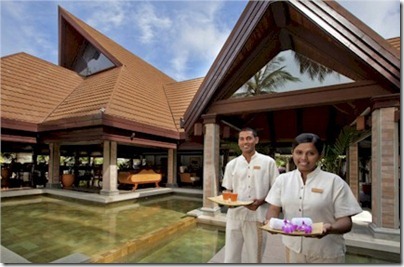 But Kurumba constantly looks for new touches and enhancements keeping it solidly in class. It’s not trying to be a super-premium with crazy luxury like butlers and underwater cinemas, but it has enough to satisfy most any fussy traveller. The price for a 7 night stay Room and Breakfast (for a couple sharing) in mid-February 2013 from London is £1460 on Kuoni. That’s a £292 per star. The next best 5-star value is Robinson Club at £426 per star.